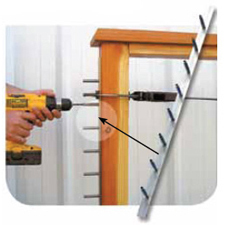 Use the drill guide to drill your pilot holes. Clamp the guide to post and drill. Subsequent drills will follow pilot holes. When ordering, allow space for clamps. A 6" overall-length drill bit is included. Please fill out our DRILL GUIDE ORDER FORM or our STAIR DRILL GUIDE ORDER FORM with your specific requirements.